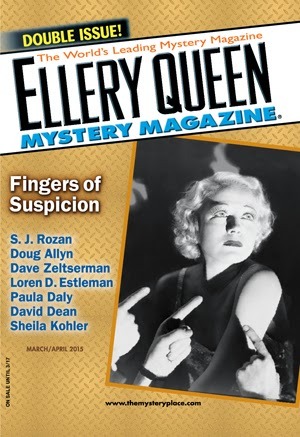 The title of this piece just happens to be the title of my latest story in Ellery Queen Mystery Magazine. This is not a coincidence. I am utilizing my God-given right to promote my work in lieu of the huge monthly check I would normally receive from our generous paymaster, Leigh Lundin. But I will not just promote, but educate as well, sprinkling tidbits of information throughout that cannot possibly be found on the internet. For instance: Saint Patrick's Day is two weeks from today. Yes, only a few hundred million of us woke up knowing this today. What the devil does it have to do with my latest groundbreaking literary effort? Very little, actually, but since this auspicious occasion just happens to be coming up, I thought I'd smoothly weave it in. Just watch my handiwork. My story takes place in antebellum Alabama, circa 1831, within the diocese of Mobile and concerns a brother and sister, murders and miracles, duels and deceptions. It ends with a hanging. St. Patrick has nothing to do with any of it. 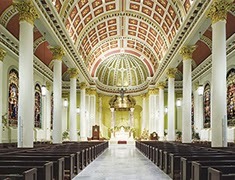 Yet, if you go to Mobile, as I have, and visit the magnificent Cathedral of the Immaculate Conception you will discover a small, unique statue of him situated to the right of the altar. If you look up, and you should, you will find a ceiling exquisitely rendered in gold leaf patterns of alternating fleur-de-lis and shamrocks, heraldic symbols of both France and Ireland. Mobile, like most of the Gulf Coast, was originally colonized by the French and, in fact, it was here that the first Mardi Gras was celebrated in North America; not in New Orleans. This was in 1703--another fun fact. It is celebrated in Mobile to this day. How did St. Patrick sneak into this decidedly French environment, you may ask? The answer lies with all the Irish priests and bishops entombed in the vault beneath the Cathedral. In those days, the Irish were mighty and prodigious evangelizers of the Catholic faith and were forever charging into the breach. It appears that they charged into the Mobile colony. The French and the Irish have a long relationship actually, as both have found themselves squared off repeatedly with their mutual enemy, the English. One happy result of this alliance was Hennessey Cognac; another the breathtaking ceiling of the Cathedral. More fun facts as promised. My protagonist opens the story with a request for one of these priests (French or Irish, it doesn't matter). He wishes to prepare himself for his impending exit from this perplexing world of ours. A rider is sent to Mobile to fetch one. Thus begins our tale of madness and murder. It's in the March/April issue along with many fine tales by such notables as Doug Allyn, Dave Zeltserman, S.J. Rozan, Loren D. Estleman, Marilyn Todd, and more! I hope that you will get a copy of this issue, and that if you do, you find your visit to L.A. (Lower Alabama) interesting. P.S. During my time here the news broke of Harper Lee's impending book release. This was big down here as Monroeville, a nearby community, is both Ms. Lee's home and the setting for "To Kill A Mockingbird." P.P.S. Oh yes, almost forgot, our fellow SleuthSayer, Dale Andrews, vacations yearly in nearby Gulf Shores, Alabama--a final fun fact. So that’s what happens when I give you a 30% pay increase! Hmmph. David, interesting collection of factoids! Thank you. Hmm, if I had to pick Hennessey Cognac or the breathtaking ceiling of the Cathedral, which would it be? Maybe pondering the ceiling while drinking the cognac. That sounds like the right approach. As does your story. Looking forward to reading it. Fun read, David, and I'm looking forward to the story. Didn't everyone get a 30% raise, Leigh? Paul, I like your thinking here--why should there have to be a choice involved? Cheque?? We're supposed to get a cheque? What a gorgeous cathedral! Nice weave-in of St. Patrick's (although you left out snakes) and Hennessey's. I'm looking forward to reading the story! David, I just finished reading your story last night. Nice one. So this is the story about a duel that you and I discussed in e-mails a year or so back. At the time, my concern was both of us submitting a duel story at the same time to AHMM. Turns out yours got published in EQMM and mine in an anthology. Nice work, keep them coming. Melodie, I should have clarified that no one has actually been paid just yet. Leigh says that the financing should be all worked out in just a few more years. After that, he predicts checks (or cheques in your language) will be cut no later than two to four years following. In the meantime he is meticulously recording our pay-in-arrears (including benefits reimbursements) in anticipation of that happy day. Eve, the statue of St. Pat is standing on the serpents in question. Two particularly aggrieved ones, if memory serves me correctly, though they dare not strike. Thanks, R.T., and yes, that is the dueling scene we discussed. Congrats on getting yours published, too.